Course Website: Official Website - Visit Kapalua Bay's official website by clicking on the link provided. Accolades: Ranked 16th in Hawaii on Golf /course Gurus' Best in State list. 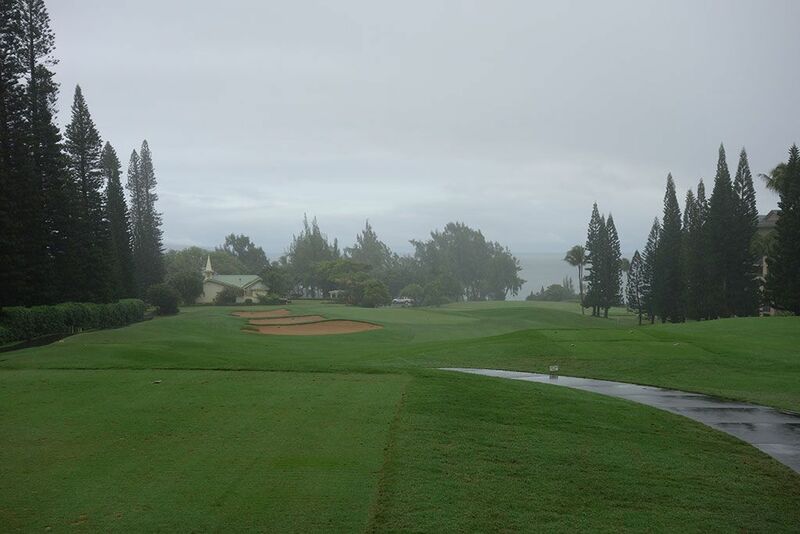 What to Expect: Though many would simply expect this course to be a resorty little add-on to Kapalua’s Plantation Course, the Bay still has some great architectural values that insure a fun round. The Plantation course is much longer and more challenging, yet the Bay course’s conditioning, surroundings, and strategic bunkering make it a very solid track. At this course, the wind is always a factor, and it surely makes the 6,600-yard course play longer than one might expect. The front nine is very short and has two holes that are directly on the ocean. Unlike the front side, the back nine is much tougher and longer. A few holes are seriously tree-lined, putting a premium on accuracy off the tee. Lastly, though fairly slow, the greens at the Bay Course are very pure and always roll truly. As a side note, the Bay course used to be one of three courses at Kapalua (the Village course is now closed) on Maui's northwest coast. The course is routed through a residential development with significant distances between some of the greens and tees thus setting it up as a course experienced while riding in a cart. The fairways are lined with trees and the course hits an early crescendo with the coastal 4th and 5th holes. Signature Hole: 5th Hole – 205 Yard Par 3 – This long par three is one of the most breathtaking and difficult shots on the island of Maui. A crystal-clear cove of more than 150 yards lies between the player and the putting surface. Below, players can see numerous sea turtles and coral reefs as well as snorkelers amongst the huge black rocks. The farthest back tee box measures to 205 yards to the green’s center but plays a few yards less than that because of the prevailing western winds on the shore of the island. The putting surface is complex with a steeply pitched area in the back. Though the surroundings are beautiful on this hole, par is an extremely tough score to come by. Best Par 3: 3rd Hole – 189 Yards – Though the 5th is probably the best hole on the course, let alone the best par three, the 3rd is an extremely challenging par three that requires golfers to be able to flight the ball down to keep it below the wind. On the right of the hole is the extremely beautiful Ritz-Carlton Kapalua. The wind is usually into the players’ faces on this downhill hole, so distance control is key. There are also two very deep bunkers on the left side of this green that must be avoided is par is your desired score. Best Par 4: 4th Hole – 357 Yards – The 4th at the Bay Course is one like no other in that players take dead aim at the pacific ocean, knowing that the strong island breezes will drift their balls into the fairway. This short, dogleg left par four is extremely enjoyable from start to finish. All along the right of the hole is gorse that will collect any wayward tee shots, whereas the left side has blackish-red lava rocks that are similar to those in the tidepool area behind the green. The second shot is usually a wedge or short iron. The green is extremely undulated and sloped from back to front. This is a great birdie chance. Best Par 5: 18th Hole – 552 Yards – This hole proves to be a very strong finishing hole to a great golf course. The tee shot is hit down a huge slope that allows for large rollouts, yielding some gaudy driving distances. Almost no players can reach this green in two because the second shot plays straight up hill. To the left is the driving range, and the clubhouse is directly behind the wide green. The green is sloped severely from back to front and is very shallow and difficult to gauge. However, it is also very wide and receptive to offline shots. Birdie Time: 15th Hole – 539 Yard Par 5 – Though the distance would show that this is a very long hole, it is just the opposite. Playing directly downwind, this downhill par five is easily reachable for almost any player. The tee shot is somewhat difficult because there is a hazard on the right and a bunker on the left, but once past the tree in the bunker, players can hit a low, running shot that feeds towards the green, leaving an easy two putt or up and down for birdie. Bogey Beware: 9th Hole – 453 Yard Par 4 – The tee shot on this hole is very simple because it is downhill and downwind with a fairly wide fairway. The second shot is extremely hard because it requires a perfect distance as well as perfect accuracy. On both the left and right sides of the green are steep runoffs that collect most golf balls hit towards the back of the green. Up and downs are nearly impossible to achieve on this green because of the severity of the green’s undulations.